What’s that slithering from the murky depths? What foul Evil plunges icy daggers into your still-beating heart? What strange beast is this? What is this red rage that drives a man to madness? Ah, it’s love. In the second prose anthology featuring occult detective Doctor Xander Crowe and his partner Sparrow, our investigative duo tackles that most arcane of human elements: amour. 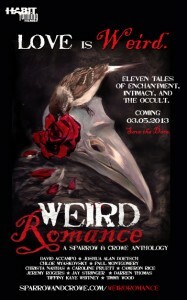 WEIRD ROMANCE features new, original stories from Sparrow & Crowe co-creators David Accampo and Jeremy Rogers, as well as a host of new and familiar contributors, including Joshua Alan Doetsch (Strangeness in the Proportion), Jay Stringer (Old Gold), Christa Nahhas and Chloe Myaskovsky (Sparrow & Crowe Halloween Special), Caroline Pruett (Chicks Dig Comics), Paul Montgomery (Weird Winter Stories), Cameron Rice, Timmy Wood, Darren Thomas, and Tiffiny Kaye Whitney (Wormwood: A Serialized Mystery). WEIRD ROMANCE is now available in the Amazon Kindle Store for only $2.99! Love Jay Stringer’s work and all the Sparrow and Crowe I’ve seen. Keep up the great work.